Today I would like to share with you before and after images of 2010 projects by Mindful Design Consulting. A new year is approaching and maybe you are thinking about remodeling your business space or you are looking for a space to start your new business right now. I hope seeing what our clients have done this year with their spaces will give you a few fresh ideas on what you can do in your space. Also some of you may know about my trip to China this September. I will share a few images of the project we worked on in a small city near Nanjing in China. Please enjoy! Don’t forget to post your reply to this newsletter on my Blog. Happy Holidays everyone and let's make this year a prosperous for our families and our businesses. Let's make this a year To Play a Bigger Game! As 2010 slowly comes to an end, we are looking forward to working with some of you again in 2011. But before the new year starts, let us share some of our designs that we are proud of. Looking back at what we have accomplished always gives a better understanding of what is possible in the future. Read more on How to Shape Up Your Business Space in 7 Steps. A lot of large offices are in the process of rebranding their images at the same time as reorganizing and restructuring their companies. The economy has been tough on all of us, and one of the best ways to show everyone the wiliness to overcome the challenges and to improve the employees' attitude is revamping the image of your company. This corporate company was looking for a new identity and a better quality exhibit space for visitors. And here is what we came up with. 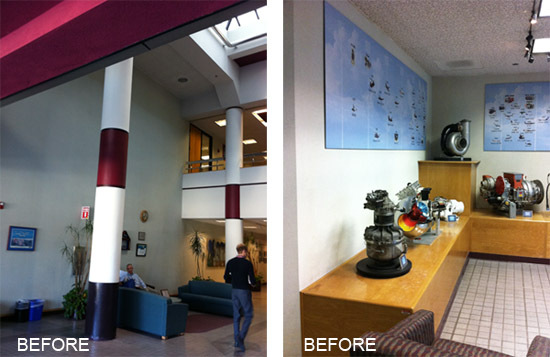 AFTER: Corporate office lobby and the display exhibit proposed design. 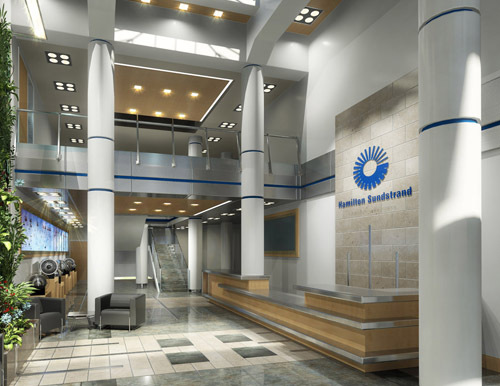 We proposed to redesign the lighting layout, use colors of the logo to tie the elements together and use subdued natural California colors of beige, gray and blue to represent the company. We also proposed to bring the metallic outside design style of the building to the interior. AFTER: Corporate office lobby with a new front desk and logo on the wall. 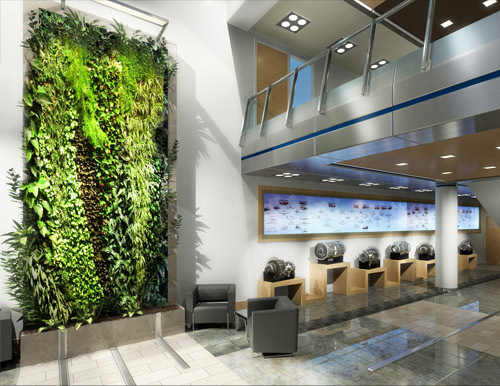 Adding green walls to the Lobby and the Dining Area will bring nature to the inside and create an inspiring work environment for employees. Main Lobby and the display exhibit of the company before. A little retail embroidery store Pacific Apparel is located in Pacific Beach, CA. I love the fact of it being close to the ocean and getting all types of foot traffic and attention from passing cars. The store needed a new identity as well as better signage on the outside. 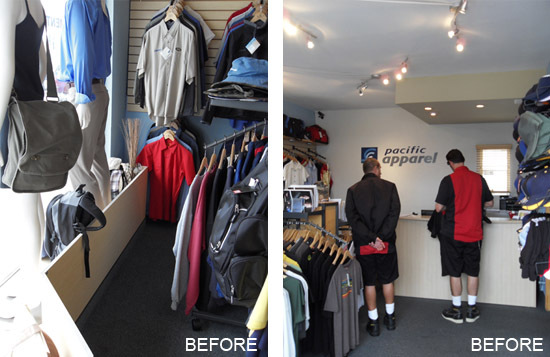 AFTER: Pacific Apparel's proposed interior design with a new desk, backlit images on the back wall and wood side walls. We proposed to use the idea of being so close to the water and create a feeling of being inside of a boat. One of the walls will be curving at the ceiling. 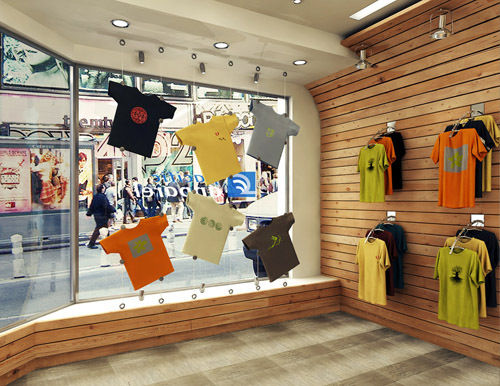 The front of the store will be displaying t-shirts suspended on boat ropes. We tried to create an atmosphere attractive to a younger crowd and to athletic professionals. 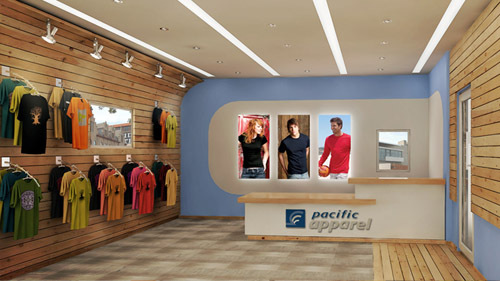 AFTER: Pacific Apparel's proposed display system will show t-shirts with embroideries - the main product of the company. On the second half of the window there will be a one-way-vew vinyl image which is invisible from the inside. A local company Speedpro Imaging specializes in commercial project graphics on windows if you would like to use it in your business. Pacific Apparel's old window display and desk. 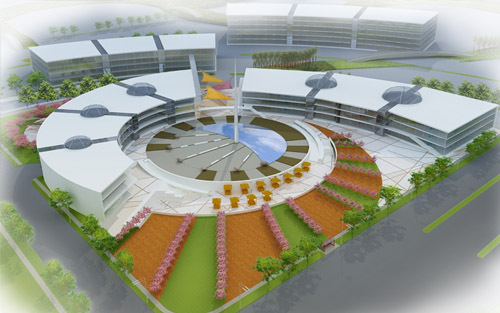 Mindful Design Consulting is very happy to announce our involvement in a large development project in China. With our help, a Chinese development company was able to secure a large property (about 100 acres of land) to build a beautiful mixed use town in the near future. We were able to provide enough master planning and schematic design for this community to make it to stand out. I personally visited West of Nanjing to present our ides to the local government and people involved in this project. Today I will share glimpses of a beautiful development which we called Garden of the Jade Dragon. What makes the Garden of The Jade Dragon different is its pedestrian park running through the whole 100-acre site connecting every building by pedestrian routes and making it safe and healthy for people and their kids to travel from any location to their homes. Jade Dragon Mall incorporated a reflective pool at the center as well as a sundial. Shading canopies were proposed to be used at the main entrance walkway. 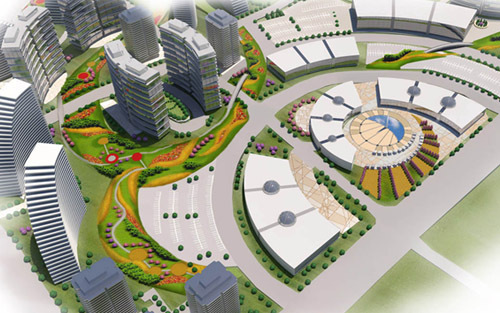 There will be a Farmer's market and flower gardens surrounding the mall. Most of the parking on the site is planned to be underground. The residential condos are planned to be sold at higher-end prices. See other residential projects Mindful Design Consulting worked on HERE. Also check out our Before And After images from last year, 2009, HERE. Today I just wanted to remind you to be conscientious about using our energy and to try switching to more energy efficient LED lights for your decoration. 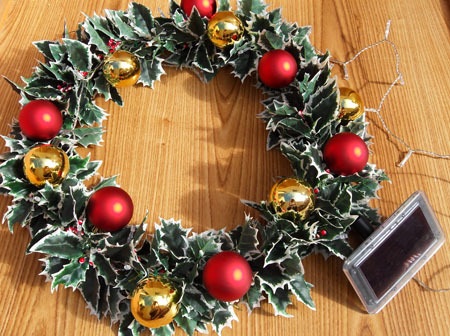 On this image you can see a Christmas wreath which I've made myself using Solar String Lights!